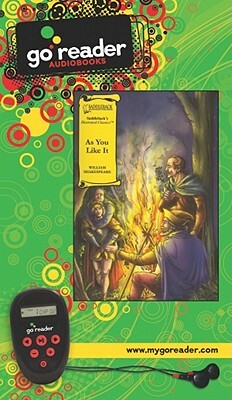 As You Like It [With Earbuds] (Go Shakespeare - Set 1) (Abridged / Pre-Recorded Audio Player) | The Drama Book Shop, Inc. The complete play in five acts. A Shakespeare Recording Society Production. As You Like It is quintessential Shakespearean comedy, complete with a loquacious clown, lovers, disguises, rifts and reconciliation's, and all within the atmospheric confines of the enchanted Forest of Arden. As the title suggests, As You Like It is a play in which everyone gets their way, where sinners are redeemed and where love holds sway over all. And because it is Shakespeare, even so light a comedy contains a wealth of keen observations about humanity in general, and in particular about the age-old tension between so-called civilized society and the state of nature from which it evolved. No less poetically-accomplished than Shakespeare's' more serious works, As You Like It is a stimulating literary pleasure from start to finish.